Register for the World Pond Skimming Championships! You, yes, you, could be one of the stars of Vail’s closing day tradition: The World Pond Skimming Championships on Sunday, April 19, 2015. Back for its 13th year, the Championships bring together skimmers from far and wide to test their buoyancy on Lake Golden Peak for the chance at the title of 2015 World Pond Skimming Champion and the grand prize – an Epic Pass for the 2015-2016 season, a pair of Liberty Skis, and a Helly Hansen base layer. This hilarious tradition of donning costumes and skimming across icy water at the legendary World Pond Skimming Championships holds strong as 75 participants careen themselves off a snow jump in the hopes of coming out on the other side in mostly one piece. The spectacle is critiqued by a panel of highly-skilled judges, who score each competitor on distance, style, creativity and water resistance. The contest gets underway at 3 p.m. and the Golden Peak venue opens at 1:30 p.m. for sponsor expos and giveaways. The top male and female competitors will each be awarded the grand prize,and a few lucky pond skimming contestants will also win a pair of Smith sunglasses. Registration for this year’s World Pond Skimming Championships opens Friday, March 20 at www.vail.com/springback and costs $75 per competitor. The field is limited to 75 participants ages 14 and older on a first-come, first-served basis. Entries for this outrageous event sell out quickly each year, so those interested in participating are encouraged to register promptly. Registration to participate must be completed online prior to the event; no on-site registration will be available. The World Pond Skimming Championships is a long-standing closing day tradition on Vail Mountain and is a well-loved part of the lineup of entertainment at Spring Back to Vail, the yearly festival to celebrate the conclusion of the skiing and riding season in Vail. It is guaranteed to be a wet, wild and wacky good time for participants and spectators alike. The schedule of entertainment for closing day on April 19 also includes a free concert from Greyboy Allstars at Solaris in Vail Village. For more information on the World Pond Skimming Championships, including rules and judging criteria, as well as the full Spring Back to Vail schedule visit www.vail.com/springback. Spring Back to Vail Expo Village at Mountain Plaza at the base of Gondola One; 9 a.m. – 4 p.m.
Portugal. The Man presented by Pepsi at Solaris. Venue opens at 5 p.m.; music begins at 5:30 p.m. Trampled by Turtles presented by Bud Light at Ford Park. 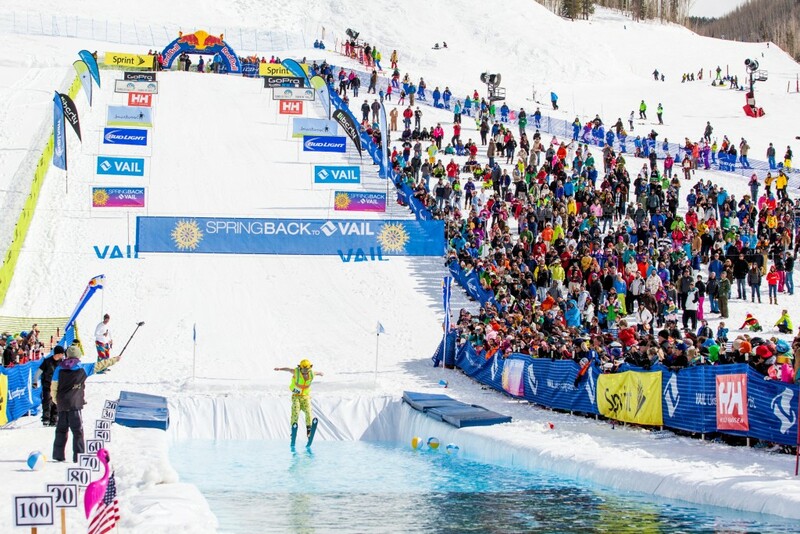 Venue opens at 5 p.m.; music begins at 5:30 p.m.
Spring Back to Vail Expo Village at Mountain Plaza at the base of Gondola One; 8:30 a.m. – 3:30 p.m.
World Pond Skimming Championships presented by Red Bull. Venue opens at 1:30 p.m.; skimming begins at 3 p.m.
Greyboy Allstars at Solaris. Venue opens at 4 p.m.; music begins at 4:30 p.m.
Spring Back to Vail is presented by Vail Mountain, Pepsi, Bud Light, Audi, Smith and Town of Vail, and brought to you in part by Helly Hansen, Liberty Skis, Vail Resorts Retail and Colorado Mountain Express.